Do you feel like a refreshing cold brew in the summer heat? Or what about an iced latte? Whichever you prefer, there are a range of factors that contribute to their unique tastes, and the temperature they are prepared at is certainly a big one. While it’s easy to appreciate the difference between cold and hot brewed coffee, it takes careful investigation to dissect how fine-tuning brew water temperatures can affect physical and sensory outcomes. Espresso coffee is commonly brewed between 90°C to 95°C. 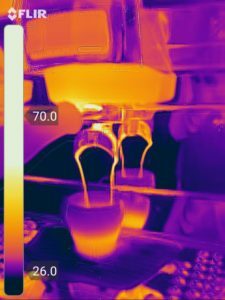 In a recent study, I looked at how five different temperature settings affected the extraction of one espresso blend. With the help of a very patient barista, 20 double espressos were prepared at each brew water temperature setting of 90°C, 92.5°C, and 95°C (lets call these flat profiles because the brew temperature is kept constant), as well as an upward (90°C to 95°C) and a downward (95°C to 90°C) gradient profile. The grinder was dialled in to yield close to 40 grams of liquid from a 19-gram dose in 27 to 32 seconds. The temperature of the coffee grinds was recorded immediately. The double shot volumetric setting was used to ensure that equal amounts of water were added to each dose of ground coffee. We then took a range of measurements to assess extraction. It was immediately clear that brew temperature had a strong effect on the shot weight. 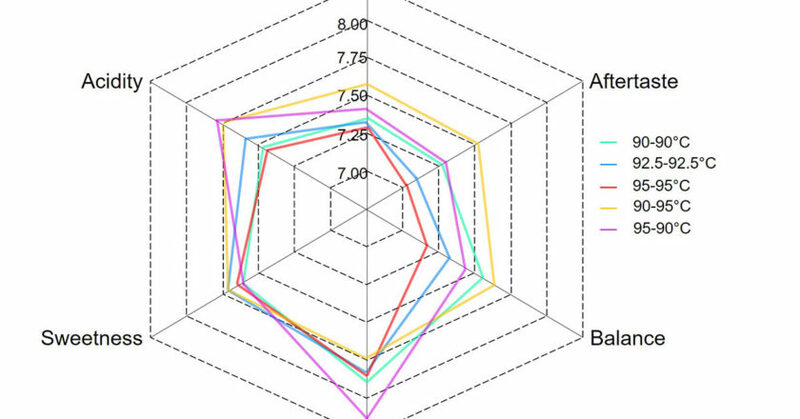 Have a look at the top graph in Figure 2, focusing on the flat profiles. As the brew water temperature increased, the shot weight decreased. Or in other words, increasing temperature decreased the flow rate through the puck, a finding supported by previous work by researchers Petracco and Liverani. But why? Lower flow rates can be caused by smaller particle sizes. Imagine water flowing through sand rather than pebbles. However, in our case, particle size was unchanged. Another thing that can decreased flow rate is a higher pressure of gases trapped inside the porous material. This makes sense: the pressure of carbon dioxide and volatile aromas inside the grinds increases with temperature, restricting the liquid flow. On top of this, swelling of the grind particles upon contact with moisture can also lower flow rates (Hillel, 2004). This certainly happens in coffee, however, I haven’t found any studies on whether the particles swell more or less at different temperatures. Now for the gradients. The downward gradient profile was close to the middle 92.5°C “flat” profile, as we would expect, since these have the same average brewing temperature. The upwards gradient profile, however, yielded significantly higher shot weights (42 +/- 0.5 grams). This is surprising, but may have a simple explanation, at least in part: the temperature of the grinds. In our experiment, the five profiles were used in randomised order and the upward gradient profile happened to be first, while the grinder was still warming up. The somewhat lower temperature of the grinds in the first group (45 +/- 1°C compared to 47.5 +/- 1°C later on), led to a slightly lower extraction temperature, resulting in an increased flow rate. That said, a 2.5°C difference in grind temperature is not quite enough to fully account for the outstandingly high shot weights measured for the upwards profile. There’s room for more investigation, but we can conclude that a few degrees change in the temperature of the water and the grinds have a significant effect on how a shot turns out. The second chart in Figure 2 shows that total dissolved solids (TDS) values roughly follow an opposite trend to shot weight: shots that stop a bit shorter are also more concentrated. Extraction yield is calculated taking both shot weight and TDS into account, therefore these values also principally reflect the effects of temperature on flow rate. 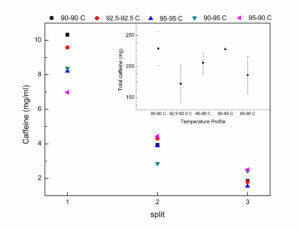 We also tracked how the different temperature profiles affected caffeine content of each espresso. 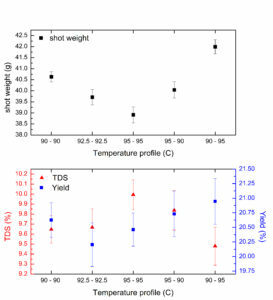 The insert panel of Figure 3 shows the total amount of caffeine measured in three randomly selected full shots from each set representing the five temperature profiles. These data correlate with the corresponding total extraction yields to some extent, however the variation between samples is too large to draw clear conclusions. The caffeine concentration of coffee beans is known to be highly variable within a blend, and even between individual beans, so this may be a confounding factor. Due to the high solubility of caffeine, we expect that most of the available caffeine will be extracted early on in the shot. To test this, we also prepared a triplicate series of split shots, separating the first, second, and third ~13 grams of each espresso, then measured the caffeine concentration. Figure 3 clearly shows that 60 to 65 per cent of total caffeine is indeed extracted into the first third of the shot volume for all profiles, followed by 20 to 30 per cent in the second split and 10 to 20 per cent in the last one. So, if you’re having a 25 to 30 gram ristretto rather than a 40-gram double shot, you’re consuming 15 per cent less caffeine on average. Sensory outcomes were tested with the help of a seven-member panel, who blind-tasted a total of 15 long black style coffees prepared using the five profiles in triplicate, in a randomised order. All judges tasted the same samples using cupping spoons. As you can see in [the lead image], the flat 95°C profile scored the worst in general. The flat 92.5°C profile performed well in terms of sweetness and acidity but fell behind for balance, aftertaste and overall scores. The flat 90°C profile achieved relatively high scores for balance and body, but it was not well regarded in terms of the other attributes. The two gradient profiles achieved the highest overall scores. The downward profile showed high scores for body and acidity, but lower on sweetness and balance. The upward profile was the most well rounded with consistently high scores on most attributes, and was the overall favourite. In conclusion, the largest impact of brew water temperature is its effect on flow rate. Higher brew temperatures lead to a slower flow rate, which, in consequence, results in a more concentrated beverage. Both upwards and downwards gradient temperature profiles showed interesting modulations in the sensory experience. I would like to thank Rancilio for providing the Rancilio Specialty RS1 espresso machine for this experiment (see more page 29), Craig Simon for the space at Criteria Coffee, along with expert advice, and the panel and baristas for volunteering their time to help with this experiment. Great coffee is a team effort.